This month, Selfridges opened The Wonder Room at its Oxford Street store, a new 19,000 square-foot space dedicated to luxury items, fine jewelry, watches, wine and other precious gifts. The Wonder Room is a luxury emporium with the buzz of the bazaar, offering customers a unique mix of products in an imaginative setting. Anchoring the space are world class luxury brands – including Hermes, Chrome Hearts, Tiffany & Co and Bulgari – housed in an "arcade" of boutiques around the perimeter of the room. Alongside, The Concept Store takes inspiration from the tradition of the Wunderkammer or "Cabinet of Curiosities" with constantly updated stock showcasing all that is new, special or intriguing – from the latest technology must-haves to cult books to exclusive gifts. In addition to gorgeous products that each of the brands will stock, there will also be individual items that are unique and out-of-the-ordinary, to bring the concept of wonder to life. For example, Hermes has created a hand-crafted winged saddle inspired by their celestial namesake, crafted from some of the World's finest skins; while rock n' roll jeweler, Chrome Hearts, a favorite among Hollywood and music royalty, has elevated the everyday sink plunger by adorning it with brilliant diamonds. B. Dazzled is the accessory and apparel boutique brainchild of two college gal-pals, Robin and Liz. Robin started it sort of with her own small jewelry making business. Eventually, Liz suggested she head to the web, and today they are both involved with the biz. Pictured above: Feeling alive, carefree, decadent, chic? Or maybe you need a little boost to achieve such a positive state of mind. Either way, Rachel Leigh's affirmation necklace is great inspiration. Available in either silver or gold plate on a 32-inch double layer pearl-accented chain. Pendant is a two-inch square. Necklaces seem to be their main jewelry items (below): Brazilian designer Coralia Leets has had her pieces featured in InStyle magazine. 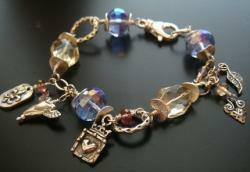 Here she combines semi precious stones with semi precious charms and a vermeil gold disk. Working in a jewelry shop can be dangerous. It can be dangerous to your pocket book, but with all the robberies I read about via jewelry news alerts, it's really not a joke. I'm not sure if this will really fend off robbers, but one jeweler has an idea for keep his jewelry safe. 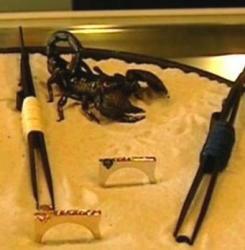 A Michigan jeweler is taking the "sting" out of crime by employing live scorpion guards. The South Lyon, Mich., store owner is using a dozen scorpions to guard his one-of-a-kind and limited edition items. It started as a temporary display of southwestern-style jewelry, but customers wanted the stinging arthropods back after the display went away. A sign advertises the store as "the most dangerous jewelry store," and the stinging security staff would certainly make a thief think twice. It has become pretty much the norm now for clothing designers to branch out into jewelry and other types of accessories. Most realize eventually the huge market out there that they will miss if they don't, and of course, it makes sense to give a total look to your clients. Anne Klein, known for stay-true fashion that you can wear forever, not only branched out into accessories some time ago, this company took it an extra step or two and started up their own all-accessories shops. Most you will find in the "big cities," so for us country mice, you have the net (thank goodness). And, you'll find plenty of Anne Klein jewelry and more by doing some Internet window shopping. Here are some watches and other jewelry goodies I found at Nordstrom.com – Yes, I know. I don't doubt that the store experience is not comparison, but still you can't beat the convenience. AK Anne Klein Bracelet Watch Rectangular dial has Roman numerals at the XII, III, VI and IX positions. Silvertone-plated brass case and bracelet feature a sandblasted, polished finish. AK Anne Klein Charm Bracelet Watch Six crystal-encrusted charms and a watch case hang from a linked bracelet. As you know by now, I'm a big Etsy.com fan. Love it! So, when I saw a sort of Etsy clone, only geared all toward fashion, well, you know. I think it's cool, brilliant in fact! We created a place for EVERYONE who loves fashion that thinks beyond the mall. Whether you want to shop, sell your own designs, find raw materials, meet others, collaborate, or just see what's new and hot in independent fashion…we hope that Smashing Darling will become a place that brings all of these elements together and evolve to be a community like no other. How do I get started on Smashing Darling ? You can get started on Smashing Darling by creating an account. Go to our homepage and click on SIGN UP in the upper right corner. Usernames can only be numbers and letters; no funky characters or spaces are allowed. Sellers, be careful when choosing your user name because it will be the one everyone sees and knows you as. Once you're registered, please consult our Buying FAQ and Selling FAQ for more info. To register as a buyer or seller, we require you to choose a username and password and to have a verified email address. Since Smashing Darling is an e-commerce site, all buyers and sellers must be over the age of 18 (or have parental permission). 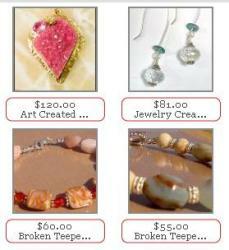 Right now, they have categories for jewelry, clothing, accessories, textile, and vintage. You can shop by browsing via category or designer. I think this has loads of potential, so I plan to keep an eye on it. Anyone else ever hear or this, bought, or sold there? Browse the Swarovski Online Sale now and take advantage of the great prices on selected items in Jewellery & Accessories, Home & Style and Figurines & Collectibles. The clearance will take place in the European and Australian Swarovski Online Shops from July 1 for as long as stocks last. In France, Greece, Italy and Austria, the discount is 30%. In Australia, Spain and Portugal you save 40% off the regular price and in all other countries 50%. Selected Swarovski Stores also offer the sale. However please note that the product selection and price reduction shown online are not binding for Swarovski Stores.